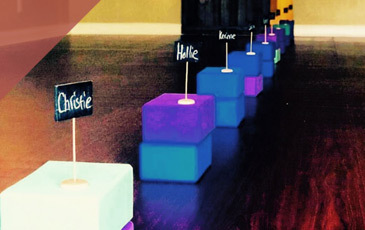 At Yoga Den, we offer a variety of class styles and traditions. Whether you are new to yoga, or a seasoned practitioner, prefer non-heated classes or love the heat, we have it all! Scroll down to check out our class offerings, and then come roll out your mat! Signature Class: Mind Body Yoga – Best class for your first experience. Our Mind Body classes are rooted in the Kripalu tradition. Mindful warm-ups begin this thorough practice, which encompasses standing, prone, seated and supine postures. Static in nature, meaning you’re not getting up and down off of the floor, this methodology allows students ample time to explore safe alignment, breath awareness, deep stretching and stress relief, while also strengthening the body. Modifications are offered for different levels of strength and flexibility, and permission language is given to encourage students to listen to their own bodies, rest when they like, and embrace individual needs. The studios are warmed only enough to offer a safe and comfortable stretch. Our Sun Power classes are high energy, high sweat Vinyasa classes with both dynamic flows and held postures. Rooted in Ashtanga, as all Vinyasa or Power classes are, the difference is postures are not always in the same order, music is played during class, and postures not found in the Primary series may be called for practice. It’s an eclectic blend of traditional and post-traditional perspectives, where each teacher puts their own creative spin into sequencing and play-lists. This class will stretch, strengthen and detox the entire body. Same as Sun Power just completed in 60 minutes. This class will stretch, strengthen and detox the entire body. More Flow (less static holding) than Sun Power, as sequences may be repeated vinyasa-style with appropriate breath cues, but unlike Bhakti, precise and even rhythmic cues are not necessarily offered. It’s more of a free-style flow. This Fusion class combines Sun Power Yoga and Mat Pilates, controlled breathing during body weight resisted movements to build core strength. This powerful, traditional practice is a specific sequence of postures (asanas) linking breath (pranayama) and movement (vinyasa.) Ashtanga is an athletic flow combining strength, flexibility and stamina for a complete practice. 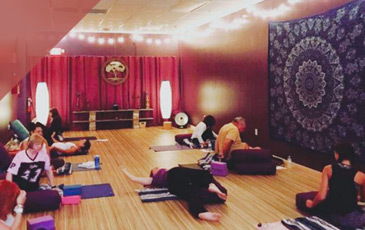 This heated class has multiple dynamic flows as well as powerful held shapes, all practiced to a mindful, even-paced rhythm, encouraging students to focus on deep pranayama, breath control. As we coordinate breath and movement, and flow through sequences designed to stimulate both the physical and energy bodies, we begin to understand and appreciate the true meaning and benefit of Vinyasa yoga, and an 8-limbed practice. Same as the Sun Power Bhakti just completed in 60 minutes. Open to yogi’s of every level, this class offers both modifications as well as options to intensify postures. This class is perfect for those looking to expand their knowledge of yoga and who are looking for something a little more challenging than our Mind/Body classes. A basic class with longer holds and grounding postures, this is a great place for new practitioners or athletes who want to slow down. This class will concentrate on foundational postures and incorporate restorative stretching to release any unnecessary stress. While cultivating strength and flexibility, the use of props may be used to enhance poses in this practice. Restorative slow flow is available to students of all levels and abilities. 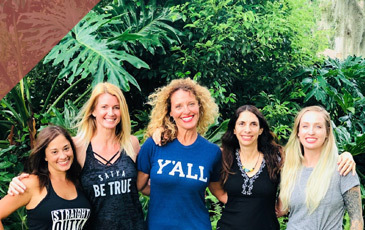 This class is designed to give you the tools and initial knowledge too enter into a group yoga class with a good understanding of what to expect. Postures will be practiced in an open format with Q and A opportunities to help you find your individual alignment, and learn how to modify when needed. Discover the various elements of Acro yoga, as we build strength, trust, and community. We will explore the fundamental poses, transitions, and communication needed to cultivate a fun safe Acro Yoga practice. When our foundation is set get ready to play! Together we will elevate from a group of strangers to a community of Acro yogis! All levels welcome, no partner or experience necessary. This class is designed to stretch the connective tissue around the joints, mostly the knees, pelvis, sacrum, and spine). A passive practice, Yin Yoga involves variations of seated and supine poses typically held for 2 to 4 minutes, accessing deeper layers of fascia. Props are offered for both modifications and depth. Restorative yoga is all about slowing down and opening your body through passive stretching with the aid of props, to achieve physical, mental and emotional relaxation . During the longer holds of these floor-based postures, your muscles are allowed to relax deeply, because props, rather than your muscles, are used to support your body. This class is for students looking for a relaxing stretch with a focus on deep breathing, while using the chair as a prop. Great for all ages…seniors who want the stability of the chair and the ease of not having to move to the floor, office workers wanting to learn how to do some yoga in their chair throughout the work day, and those simply wanting to stretch, breathe and relax!